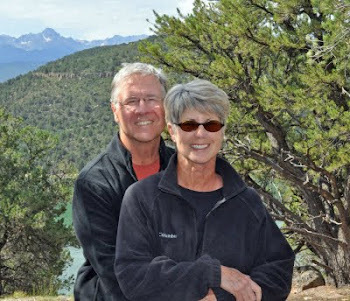 Find us on Google+ Rick and JoAnne's RV Travels: What is it about the Missions? I’m not sure what the draw of missions is for us but we sure love visiting, taking photos, and learning about them. Is it the history, the religion, the fascination about the people who built them, their location and way of life? I guess in the end it doesn’t really matter since whenever we see or hear about one…we are there! The most recent discovery was the Tumacacori Mission National Historical Park. When we had visited Tubac we had seen the sign for it but didn’t stop, so of course a return trip to the area was imminent. Interestingly enough, it was established initially by the Jesuits (the “black robes”), and then later the Franciscan friars carried out the remainder of the work, as they did with another mission we visited in Arizona, and wrote about in our blog, the San Xavier del Bac mission. Father Eusebio Kino was again involved in the creation of this mission. The renovation work on some of the missions’ buildings is evident especially on the physical remains of the mission church, San Jose de Tumacacori, the associated cemetery, mortuary chapel, and portions of the convent area. You will be able to see this from some of the photos. There is a walking tour lead by a guide, which we should have taken, and of course you can roam about the grounds, read the numbered plaques, go through the wonderful museum, and take tons of photos, which we did do! On the grounds they do have some local volunteers giving demonstrations (and tastings) on the art of making flour or corn tortillas. Very interesting and yummy!!! Inside of the visitor center there was a demonstration from the Tohono O’odham Reservation on the tribe’s centuries-old-basket-weaving techniques. All in all, it was yet another discovery for us adding to the pieces of the adventure we find so fascinating. More pictures here. Sounds like a wonderful day of discovery! I love the missions! We have been there and love the Tucson area. We also loved the missions in the San Antonio area. What an impact they made on our country! Pam, yes it was. The great thing about not being on a time constrained schedule is enjoying the journey and vs. focusing on a destination. Randy and Pam, We too have visited and enjoyed the San Antonio missions. Fun learning about that phase of our history. Ingrid, We have been in Santa Fe several times - but never for an extended period of time. We are really looking forward to it. Its a great question. For me the draw is the story of the people and their innovation during their time. Amazing people. the church looks antique and somehow it represents how christian catholic propagates their faith.